As service providers transform their networks from traditional, physical infrastructure to a more dynamic, virtual one, they face new challenges in delivering high service quality across an increasingly complex hybrid network. Service assurance tools and processes have always been instrumental in helping achieve service excellence, and they remain hugely important in delivering the desired customer experience in the face of increasing customer expectations. However, the dynamic nature of emerging network technologies (including NFV, SDN and 5G), coupled with the interim transition between physical and virtual networks, has created an environment that is constantly changing – one which traditional assurance solutions were not built to handle. Indeed, managing networks has become a multi-layer problem involving a combination of physical, logical and virtual layers. And while assuring QoE within this dynamic and uncertain environment is far from straightforward, new service assurance solutions are close at hand. 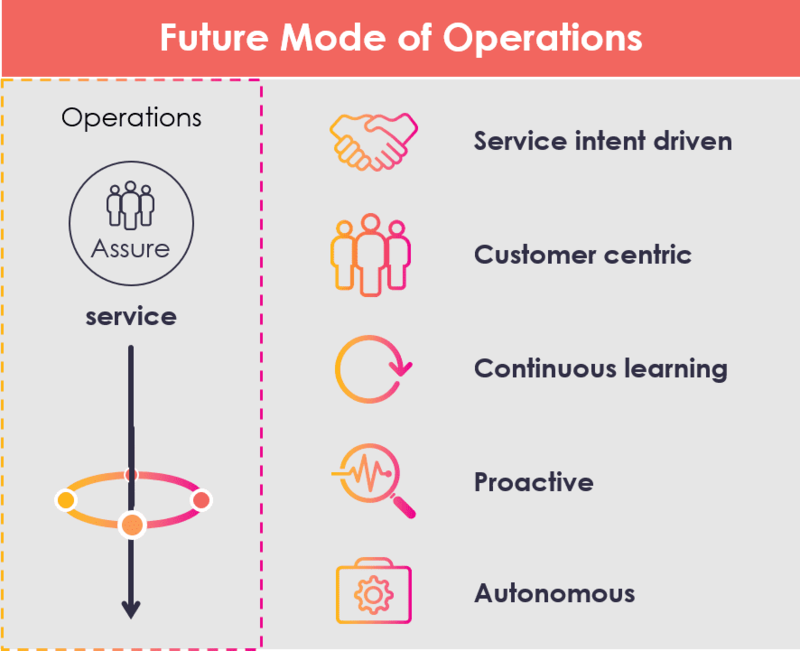 Service providers’ current mode of operations typically takes a highly manual, bottom-up and resource-centric approach to service assurance, involving a reactive “firefighting” rather than proactive, customer-centric approach. Virtual networks however, consist of continually changing virtual network functions (VNFs) that are driven by service demands. This enables the hybrid networks being deployed today to be more self-managing and self-healing, aided by a design that enables them to adapt and re-organize as events dictate. For service operations, the consequence is the need to adapt to meet the needs of a dynamic network. Assurance processes will be highly automated, proactive and customer-centric, whereby continuous learning and predictive real-time analytics techniques will be incorporated to detect and resolve problems. But to accommodate such change, the future mode of operations must evolve to shift the focus towards designing how service intent is assured upfront – from the instant it is created. Furthermore, it must focus on maintaining the integrity of the delivered customer service as its primary objective (rather than just focusing on the network itself). Real-time, hybrid inventory systems will also play a key role in enabling automated service assurance. Advanced hybrid inventory systems contain the full-service hierarchy, including virtual, logical and physical network layers, as well as their interrelationships. Here too, service assurance systems can query the hybrid inventory in real time to understand the network infrastructure for faster, more accurate root-cause analysis. An additional challenge for service providers is the need to meet increasingly demanding SLAs for both order fulfillment and service quality objectives. For this, they will need to implement systems that provide closed loop assurance. This involves gaining an understanding of the service offering and customer as a whole via continuous monitoring and surveillance to detect network and service problems rapidly, and then executing self-healing to preserve the SLA without human intervention. As an example, consider a hybrid SD-WAN, which utilizes software-defined networking to provide multiple sites with access to vCPE services, including centralized security functions. Here, the SD-WAN may be provisioned with both dedicated MPLS and broadband internet links supported by a combination of virtual and physical network functions. But at some later stage, security performance issues could arise during authentication due to a poorly performing internet link at the data center. Such a situation could go unnoticed by the service provider until the customer complains, since no alarms would have been reported at the service level. But by maintaining a service intent-driven approach, remote virtual test agents can be deployed as part of the predefined assurance policies to continuously test the performance of SD-WAN links, enabling them to proactively detect service degradation well before the customer feels any impact. The system would then trigger autonomous re-routing of the security traffic to reduce any service impact while the link problem is resolved. 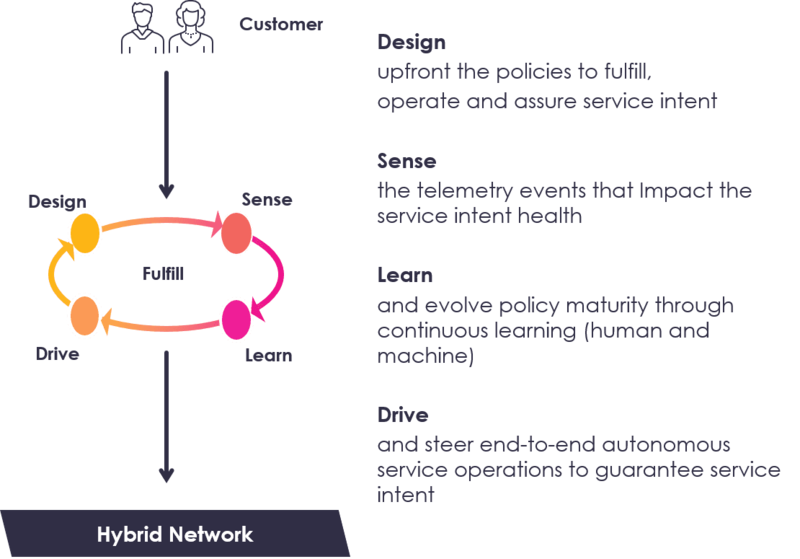 While delivering service assurance across a complex, hybrid and dynamic network can be challenging, new approaches to operations with closed loop assurance processes will proactively ensure that for the customer, the service experience remains seamless and high-quality. Learn more about closed loop service assurance and Amdocs hybrid-ready inventory. The post Delivering service assurance across a complex hybrid network appeared first on RCR Wireless News.